Lauren Malloy is one of three co-founders of Women’s Heritage Skillshare, which helps bring elements of the homestead to everyday life through workshops and their blog. With so many traditional skills being neglected in our busy, everyday lives, we felt it was important to highlight the work of Women’s Heritage Skillshare and their effort to resurrect elements of the homestead while helping us incorporate them into our daily lives. Lauren, together with Ashley Moore and Emma Moore, host workshops that are usually three hours long and host anywhere from ten to twenty women. They take place at different locations throughout Santa Barbara County. 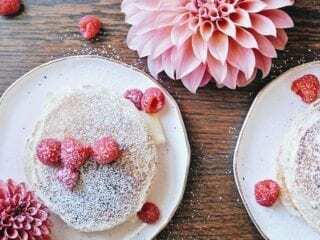 Their blog consists of recipes, and information on herbalism and animal husbandry, while also profiling inspiring women who embody their mission. Darling Magazine: Thank you for joining us, Lauren. How did the vision of Women’s Heritage Skillshare come to fruition? Lauren: A few years back I hosted a fermentation class at my home. The gathering was so sweet and informative and it felt so good to spend the afternoon learning with a group of women that it sparked the idea for WHS. However, time passed, I had my second child and I hadn’t hosted another class, even though I was craving it. Then I met my partners, Ashley and Emma, through the school that my oldest daughter was attending. We started talking about recipes, animals, and herbs and began sharing ideas together. It was when Ashley, Emma and I with our families, decided to go on a trip together that Women’s Heritage Skillshare was born. It was in the Sierra mountains that we realized we each had something different to contribute to our project – Emma with her knowledge of cooking, Ashley with her knowledge of plants, and me with my knowledge of animals. Together we had the same vision of bringing women together to resurrect skills from decades past and bring these skills to modern, everyday life. Together we had the same vision of bringing women together to resurrect skills from decades past and bring these skills to modern, everyday life. DM: What does a typical day look like for you? Lauren: I stay at home with my two daughters so everyday is different for me depending on what is going on with them, but what stays the same is feeding and cleaning! Lots and lots of feeding and cleaning! We have 20 chickens, three dogs, four cows, four horses and a cat, so before we leave the house everything has to be fed, checked on, cleaned up after and watered… and then this all happens again in the evening. So we spend a lot of time around our animals. The girls are usually helping me or running around or busy with one of the animals as I do the chores. It’s a lot of work, but I can’t picture it any other way, as it is our family’s time together and our daily rhythm. DM: What are some ways women can incorporate elements of the homestead into their everyday life? Lauren: My partners and I incorporate elements of the homestead into our lives in different ways. I by having animals, Emma by cooking from scratch and experimenting in the kitchen, Ashley by always incorporating different plants into her life in various ways. Experimenting with the elements that resonate with you personally is important, but you also have to experiment outside your comfort zone to find those passions. For example, Emma has gotten me into having a sourdough starter and now I love making my own bread, I had no idea this would be a passion for me until she taught me. The goal with WHS is that through our blog and classes we can help women explore, discover and support the elements they are excited about. DM: What are some traditional practices that are relatively easy to learn and implement? Lauren: There are so many little interesting things you could easily learn and then implement into your life. So many things intimidated me before I tried them and now that I have done them, I find them pretty simple. My partner Ashley has been studying herbalism and has taught me to identify and incorporate many edible plants into my life that were growing right outside my door! She has taught me not only how to make a beautiful floral salad, but also how to make infused oils, salves and tinctures which has been so useful and fun! DM: What are some common misconceptions that you hear about homesteading? Why do you think these exist? Lauren: Ashley, Emma and I are far from pioneer homesteaders; thankfully we have modern day amenities. It seems one of the biggest misconceptions about homesteading today is that it is a picturesque, aesthetically perfect, almost glamorous lifestyle. These misconceptions exist because it is much prettier to show the beautiful setting of a cow in the field than a picture of a slaughtered cow. The reality of having a true homestead must be a very difficult daily existence, as even having different aspects of it in our modern lives can be hard. I know that, particularly with having animals, it can be so beautiful when things are going well, but it can be incredibly challenging when things go bad. DM: Share some of the benefits you personally have experienced from practicing traditional skills such as foraging, fermentation and herbalism at home? DM: What elements of practicing traditional skills do you think our society is most missing out on in our culture today? Lauren: To me, it seems like our society is missing a connection to nature and to the past. Technology has of course made our life easier in so many ways, but it is important not to forget about traditional skills. It feels like big brands are trying to take away our ability to make what they are selling. I find, when I take the time to understand how something is made and/or I know what ingredients are going in it, I feel so much more connected to whatever it is I’m making. I love passing the knowledge I am learning to my girls; it feels even more special and pertinent as our society focuses on bigger, better and faster. It feels like big brands are trying to take away our ability to make what they are selling…when I take the time to understand how something is made and/or I know what ingredients are going in it, I feel so much more connected to whatever it is I’m making. DM: I think some women like myself daydream about living “off the grid” and enjoying a more traditional, sustainable and simpler lifestyle. What advice do you have for women who are drawn towards this way of life, but don’t know how to incorporate this way of living into their modern day lives? Lauren: Taking small steps is the way to move towards a more traditional, simpler lifestyle. Empower yourself by learning and doing. For most it’s not going to happen overnight. For me, it has been making an effort to set aside time for new learning, experimenting and finding friends who want to do it with me. It can be as simple sharing a loaf of bread you made with family and friends or getting a couple backyard chickens. I think it’s about enjoying the process, discovering your passions along the way, and being inspired to continually learn throughout life! Allie is a writer, dreamer, and kooky surfer-girl/wannabe cowgirl who lives in North Santa Barbara County. She serves as the Founder and Director of Wonderfully Made, a non-profit dedicated to helping young women know their value and worth. Loved this article–especially this passage: “It feels like big brands are trying to take away our ability to make what they are selling…when I take the time to understand how something is made and/or I know what ingredients are going in it, I feel so much more connected to whatever it is I’m making.” This is why I make my own skincare. I love feeling connected to every ingredient and intention that goes into each product, and I love how empowered I feel not having to rely on “the man” (AKA Big Cosmetics) for beautiful and nourished skin. I also feel that the “old” feminism that taught us that traditional skills made us subservient to men was very damaging. There’s nothing subservient about being able to take your skin, health, and home into your own hands. Reclaiming traditional skills and teaching others how helps modern women reclaim their empowered femininity, without relying on patriarchal institutions. This is the NEW feminism. I love your blog and workshop series. I’m a modern woman who also appreciate the essence of homesteading (I also blog about it – http://www.thehomesteadista.com). I’m curious how you foresee working WOSH) or urban women incorporating these skills into their everyday life? What you said about country-life/homesteading being glamourized really resonates. Anyone who has ever lived on a farm or had non-pet animals and a sustainable garden can attest to the hard work, the daily grind involved. Keep up the good work ladies! ENJOY AND BEST OF LUCK TO ALL OF YOU! Thank you for sharing how traditional skills are still relevant to the modern woman/society! My husband,son, and I are embarking on this Journey. We are about to get started with a few backyard chickens, and get a garden read for next spring. I am trying to cook more things from scratch and learn to can.. which can be challenging with a toddler. Great post!!! Great article. I really appreciate this honest and realistic look at homesteading. It’s important that we don’t lose these skills, but important that we don’t become nostalgic about them, too!